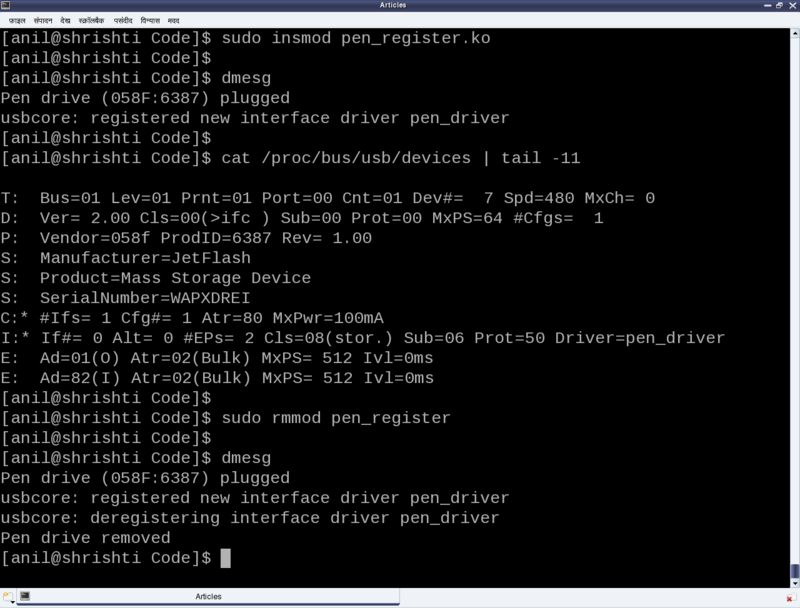 This eleventh article, which is part of the series on Linux device drivers, gets you started with writing your first USB driver in Linux. Pugs’ pen drive was the device, Shweta was playing with, when both of them sat down to explore the world of USB drivers in Linux. The fastest way to get hang of one, the usual Pugs’ way, was to pick up a USB device and write a driver for it to experiment with. So, they chose pen drive aka USB stick, available at hand. 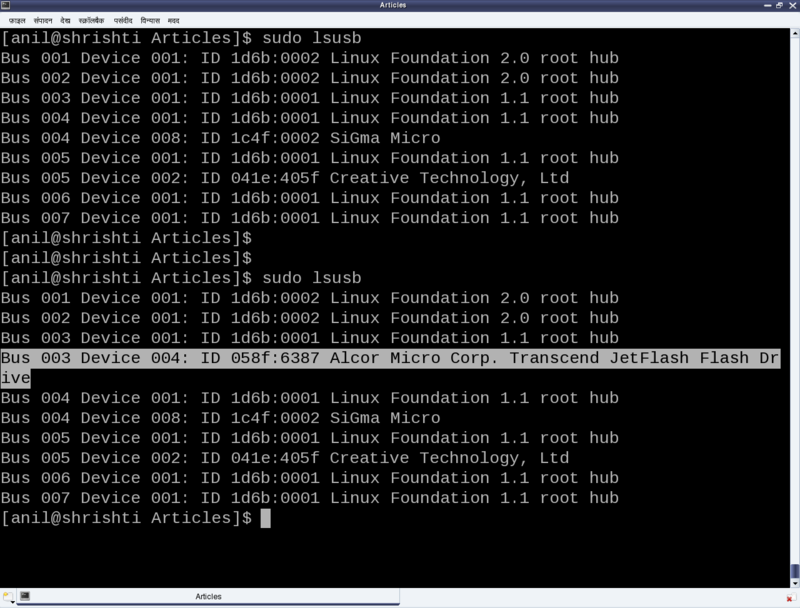 It was JetFlash from Transcend with vendor ID 0x058f and product ID 0x6387. Whether a driver of a USB device is there or not on a Linux system, a valid USB device would always get detected at the hardware and kernel spaces of a USB-enabled Linux system. A valid USB device is a device designed and detected as per USB protocol specifications. 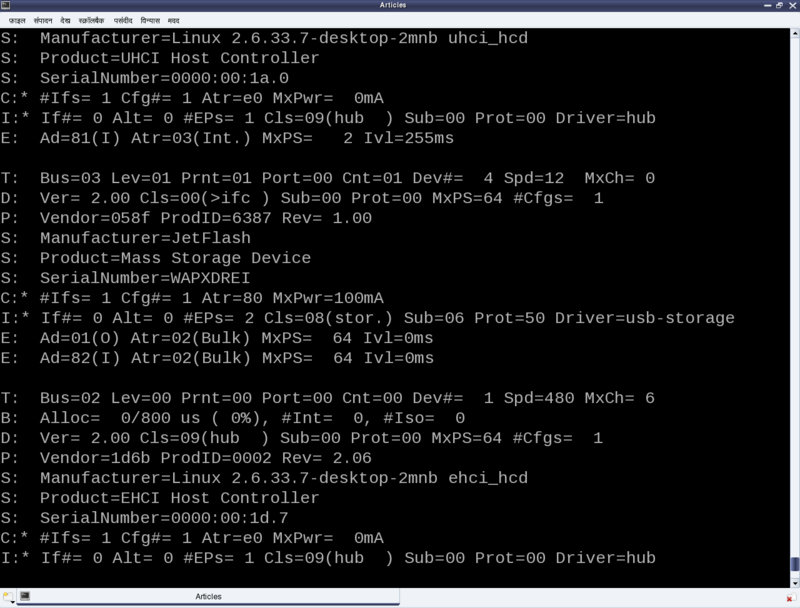 Hardware space detection is done by the USB host controller – typically a native bus device, e.g. a PCI device on x86 systems. The corresponding host controller driver would pick and translate the low-level physical layer information into higher level USB protocol specific information. 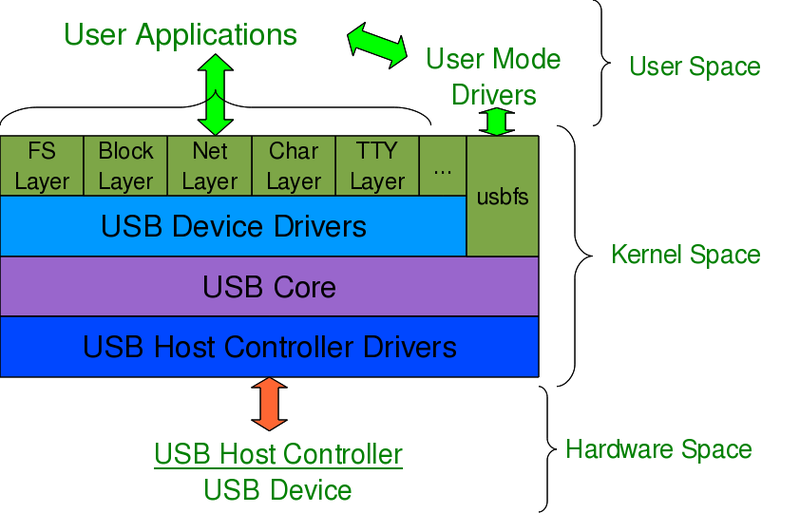 The USB protocol formatted information about the USB device is then populated into the generic USB core layer (usbcore driver) in the kernel space, thus enabling the detection of a USB device in the kernel space, even without having its specific driver. After this, it is up to the various drivers, interfaces, and applications (which are dependent on the various Linux distributions), to have the user space view of the detected devices. 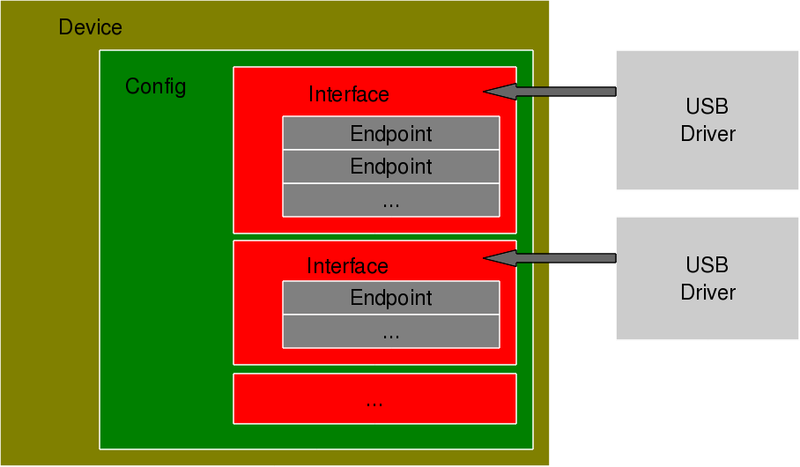 Figure 17 shows a top to bottom view of USB subsystem in Linux. A basic listing of all detected USB devices can be obtained using the lsusb command, as root. Figure 18 shows the same, without and with the pen drive being inserted into the system. A -v option to lsusb provides detailed information. In many Linux distributions like Mandriva, Fedora, … usbfs driver is loaded as part of the default configuration. This enables the detected USB device details to be viewed in a more techno-friendly way through the /proc window using cat /proc/bus/usb/devices. Figure 19 shows a typical snippet of the same, clipped around the pen drive specific section. The complete listing basically contains such sections, each for one of the valid USB devices detected on the Linux system. To further decode these sections, a valid USB device needs to be understood first. All valid USB devices contain one or more configurations. A configuration of a USB device is like a profile, where the default one is the commonly used one. As such, Linux supports only one configuration per device – the default one. For every configuration, the device may have one or more interfaces. An interface corresponds to the functionality provided by the device. There would be as many interfaces as the number of independent functionalities provided by the device. So, say an MFD (multi-function device) USB printer can do printing, scanning, and faxing, then it most likely would have at least three interfaces – one for each of the functionalities. So, unlike other device drivers, a USB device driver is typically associated/written per interface, rather than the device as a whole – meaning one USB device may have multiple device drivers. Though definitely one interface can have a maximum of one driver only. As per USB protocol specification, all valid USB devices have an implicit special control endpoint zero, the only bi-directional endpoint. Figure 20 shows the complete pictorial representation of a valid USB device, based on the above explanation. But surprisingly the results wouldn’t be as expected. Check for dmesg and the proc window to see the various logs and details. Not because USB driver is different from a character driver. But there’s a catch. Figure 19 shows that the pen drive has one interface (numbered 0), which is already associated with the usual usb-storage driver. Now, in order to get our driver associated with that interface, we need to unload the usb-storage driver (i.e. rmmod usb-storage) after plugging in the pen drive, and then load our driver. Once this sequence is followed, the results would be as expected. Figure 21 shows a glimpse of the possible logs and proc window snippet. Repeat hot-plugging in and hot-plugging out the pen drive to observe the probe and disconnect calls in action – but don’t forget unloading the usb-storage driver, every time you plug in the pen driver. “Finally!!! Something into action.”, relieved Shweta. “But seems like there are so many things around (like the device ID table, probe, disconnect, …), yet to be assimilated and understood to get a complete USB device driver, in place”, she continued. “Yes, you are right. Let’s take them one by one, with breaks”, replied Pugs taking a stretching break. Make sure that you replace the vendor id & device id in the above code examples by the ones of your pen drive. One may wonder, as how does the usb-storage get autoloaded. The answer lies in the module autoload rules written down in the file /lib/modules/<kernel_version>/modules.usbmap. If you are an expert, you may comment out the corresponding line, for it to not get autoloaded. And uncomment it back, once you are done with your experiments. This entry was posted in Linux Device Drivers and tagged Device Drivers, LFY, Linux, OSFY, USB Device Drivers, USB Drivers on December 1, 2013 by Anil Kumar Pugalia. This eleventh article of the mathematical journey through open source, explains curve fitting & interpolation with polynomials in octave. In various fields of physics, chemistry, statistics, economics, … we very often come across something called curve fitting, and interpolation. Given a set of data points from our observations, we would like to see what mathematical equation does they follow. 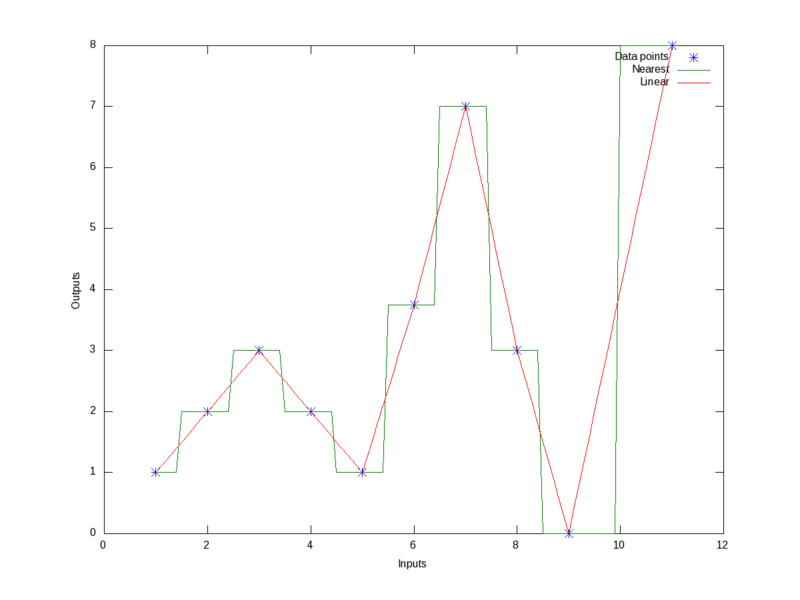 So, we try to fit the best curve through those data points, called the curve fitting technique. Once we have the equation, the main advantage is that then we can find the values at the points, we haven’t observed by just substituting that value in the equation. 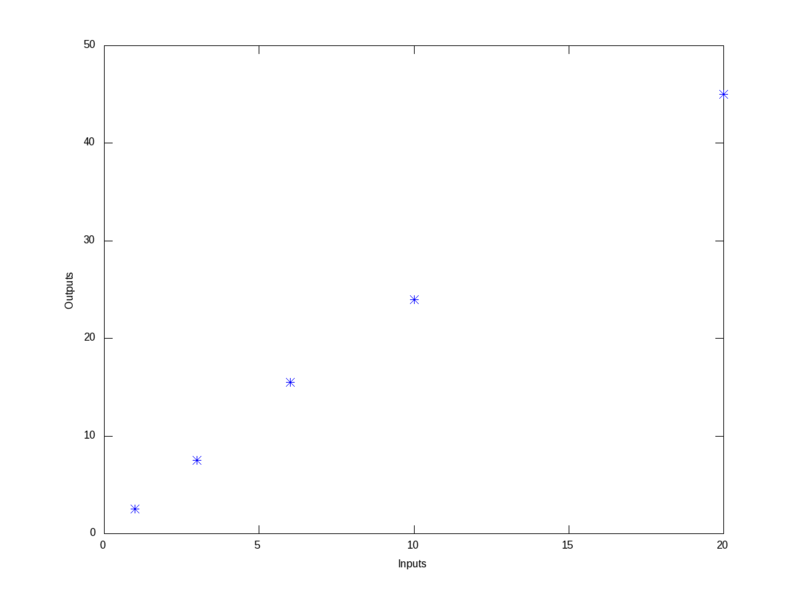 One may think of this as interpolation. 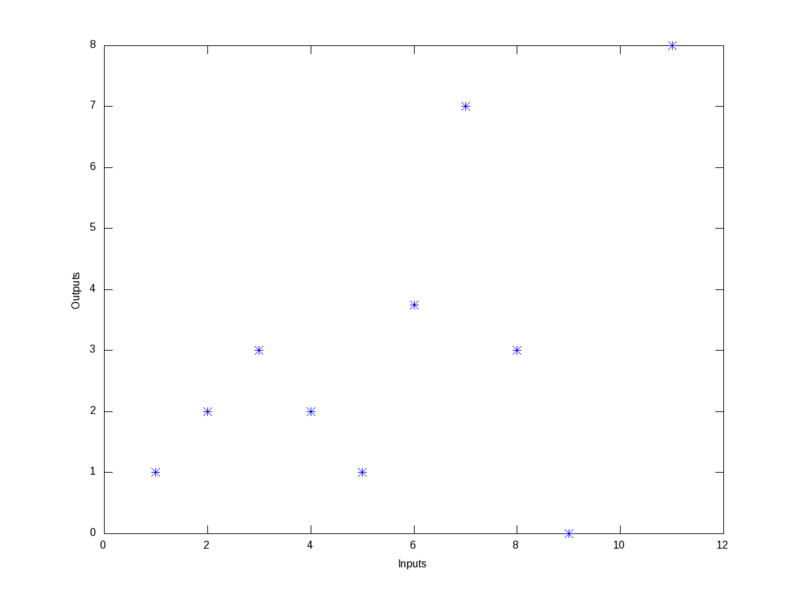 But this is not exactly interpolation. As in interpolation, we are restricted to finding unobserved values only between two observed points, using a pre-defined curve fit between those two points. With that we may not be able to get values outside our observation range. But the main reason for using that is when we are not interested or it is not meaningful or we are unable to fit a known form of curve in the overall data set, but still we want to get some approximations of values, in between the observed data points. Enough of gyaan, now let’s look into each one of those. 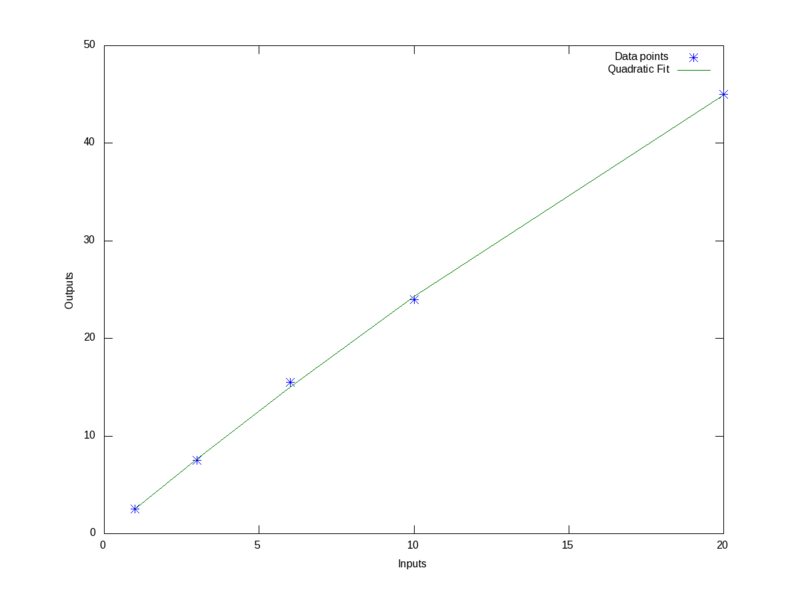 Figure 8 shows the data points and fitted quadratic curve. All the values above can be interpreted in the similar way as earlier. And we note that the standard deviation has come down further. 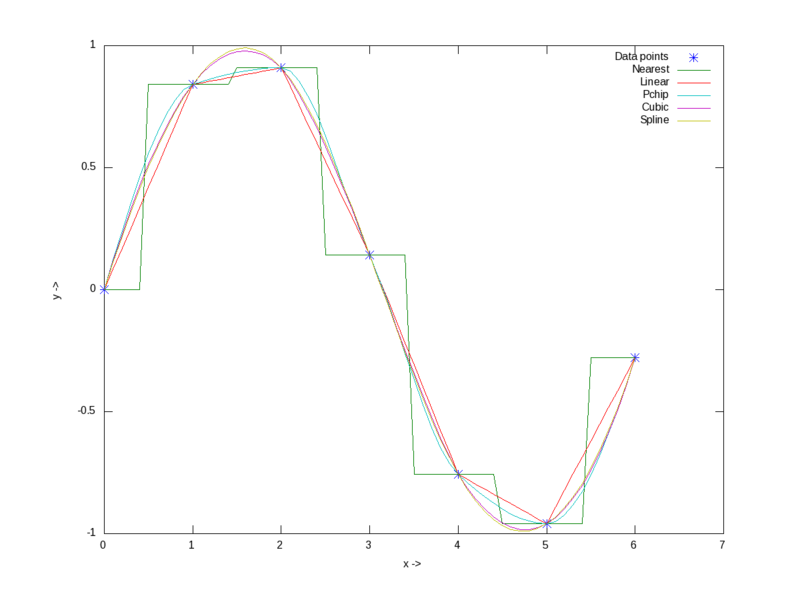 In fact, as we increase the polynomial order further and further, we will definitely note that the standard deviation keeps on decreasing, till the order is same as number of data points – 1, after which it remains 0. But, we may not like to do this, as our observed data points are typically not perfect, and we are typically not interested in getting the standard deviation zero but for a fit more appropriate to reflect the relation between the system’s input and output. Now, say we have the following wierd data points, listed as (x, y) pairs: (1, 1), (2, 2), (3, 3), (4, 2), (5, 1), (6, 3.75), (7, 7), (8, 3), (9, 0), (11, 8). Figure 9 shows, how wierd they look like. Figure 10 shows the same. Figure 11 shows the visualization of the same for your eyes. With today’s curve fitting & interpolation walk through, we have used some basic 2-D plotting techniques. But there are many more features and techniques to plotting, like marking our plots, visualizing 3-D stuff, etc. Next, we’ll look into that. This entry was posted in Mathematics and tagged Interpolation, LFY, Linux, Maths, Octave, OSFY, Polynomial Curve Fitting, Polynomials on December 1, 2013 by Anil Kumar Pugalia.